Aveeno claims on the description for their eczema therapy cream that it has been dermatologist recommended for over sixty years, which is misleading because it is a generalization that doesn’t necessarily correspond to the product at hand. The fact is, that is about how long Aveeno has been in business. Anyway, I heard from a friend that for eczema treatments, Aveeno would be the way to go and would provide me with the fastest relief. This proved to be true for the most part. After only a couple of days, the itching and scratching was gone. However, it was only a temporary relief and once I stopped using it, the itching and scabby skin was back full force. The only active ingredient is colloidal oatmeal, but also contains many inactive ingredients which are all from natural sources such as Water, Glycerin, Panthenol, Petrolatum, Isopropyl Palmitate, and Avena Sativa Kernel Oil. – You must reapply a lot. Aveeno, while they may skew some facts, is overall a pretty trustworthy company. Their eczema therapy skin cream is accepted by the national eczema association, it is steroid free, and has been shown, through clinical tests, to actually work. 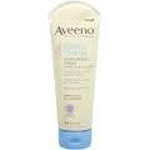 If you want a product that you know will provide you with the quick relief that you need to get through the day, then Aveeno is the right one for you, but be warned, relief won’t last as long as an over the counter prescription might, or something with a little more oomph. Hi I am adnan.I have also eczema on my face.I want to say that one cream which is shown on the top right of this page looks different than the one which is shown down under with the other creams. are they both the same ?